Keeping my finger on the pulse of the nation, one thing I have noticed recently is the number of people who no longer own a printer… after all, why would you need to print anything out? 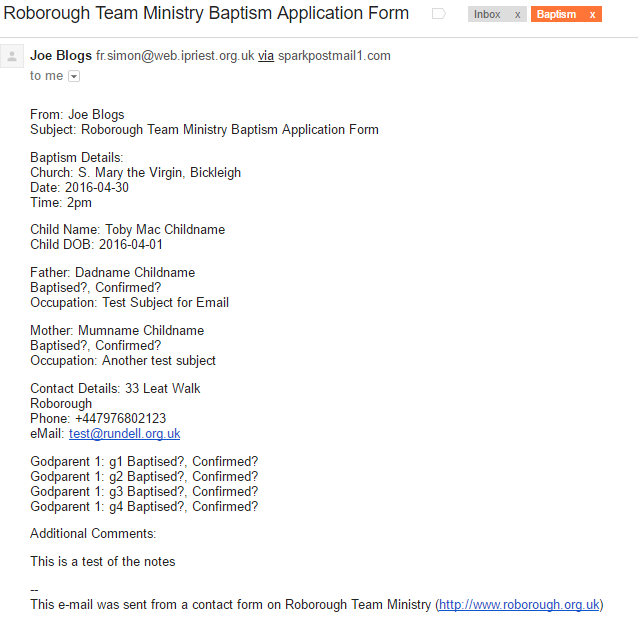 Like a baptism application form, for example… What is the point of having the forms online if people can’t then send them to you? The advantages of an electronic version are legion: no misreading of badly written forms, the ability to print them off and/or save them as pdfs so you have a record that can’t be lost, a copy in the mail archive (in Gmail, I never delete messages, except spam and adverts) and an easy solution for people to complete in their own homes. As our website is (like so many others) in WordPress, I have sought out a free, flexible plugin which does what I need. 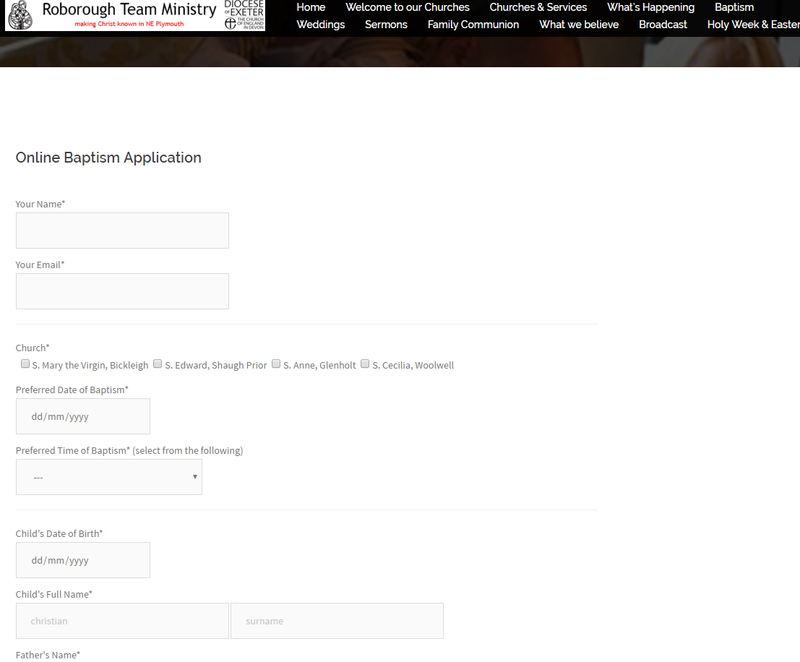 I am using Contact Form 7 which I found to be a doddle to configure. Obviously, you need to configure it for your own needs, but the design and layout is quite self-explanatory. Have fun! As people arrive they will be met by Hoodies who will have collection bags and offer them money… hand in take a coin Point – to surprise people – that’s not what I expected – church takes money doesn’t give it away ! My dear friends, Welcome to Holy Ground, a safe, sacred space where all are valued, all are loved, all are respected. Tonight we consider the upside down nature of the Kingdom of God: where the rich are poor, and he poor are rich, and where we discover that it is more blessed to give than receive. As you came into this sacred space tonight, you were invited to take a coin – unusual, I know, don’t we usually do it the other way round and ask you for money in Church? How did it feel? Especially now that I tell you that it’s yours, a gift freely given, to do with as you wish, to do with as God calls you. Tonight we think of prosperity and poverty, of security and homelessness, of the values of the Kingdom and the awkward questions that that poses to society. 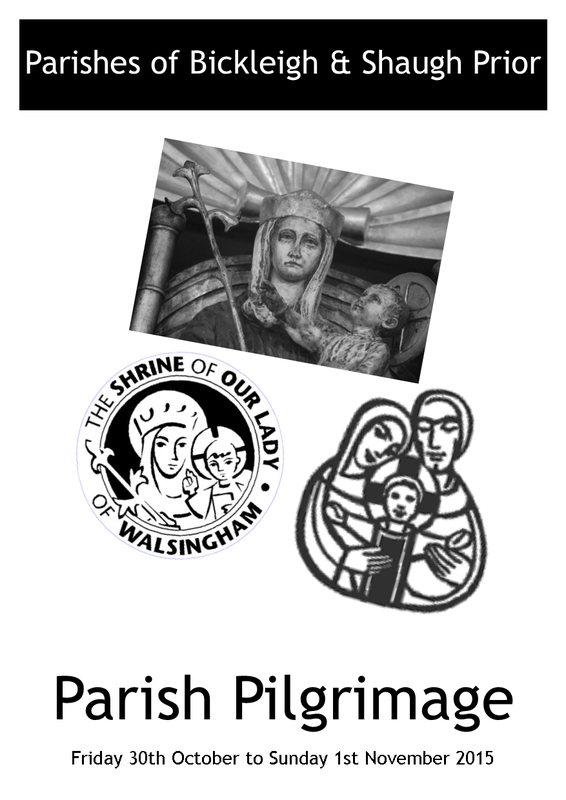 To help us tonight, we are pleased to welcome David Rhodes, a former journalist and parish priest. His extensive work among homeless people resulted in a series of ground breaking books on spirituality and social justice and his innovative Retreats on the Streets. David’s contact with marginalised people led to the discovery that the Gospel is not only good news for the poor but may also be good news from among those we call the poor. And so we come to dwell in the Light. Three images on screen. Live voices. I am a widow, a refugee, longing to return home and raise my orphaned children in peace. Who will give me a voice today? I am an old person, struggling to live on my pension, lonely and fearful of what tomorrow will bring. Who will give me a voice today? I am a child growing up believing that because I have less, I am worth less. Who will give me a voice today? Through the power of his Spirit at work within you. Offertory – ‘Thou who was rich beyond all splendour’. It is truly right and just, our duty and our salvation, always and everywhere to give you thanks, Father of mercies and faithful God. For you have given us Jesus Christ, your Son, as our Lord and Redeemer. He always showed compassion for children and for the poor, for the sick and for sinners, and he became a neighbour to the oppressed and the afflicted. By word and deed he announced to the world that you are our Father and that you care for all your sons and daughters. made once for all upon the cross. Lord I am not worthy to receive you but only say the word and I shall be healed. The + Father, the Son and the Holy Spirit, be with you always. The Peace of the Lord be always with you – Allelulia! Allelulia! And also with you- Alleluia! Alleluia! Today we celebrate the feast of Saint Blaise (Blase, Blaize, who knows? ), who was bishop of Sebaste in Armenia in the fourth century. Before being martyred, he is said to have healed a boy who was choking. Tradition also has it that he was martyred by beheading, face up. Since the eighth century, Saint Blaise has been venerated as the patron of those who suffer from diseases of the throat. We pray in a special way today for protection from afflictions of the throat and from other illnesses. 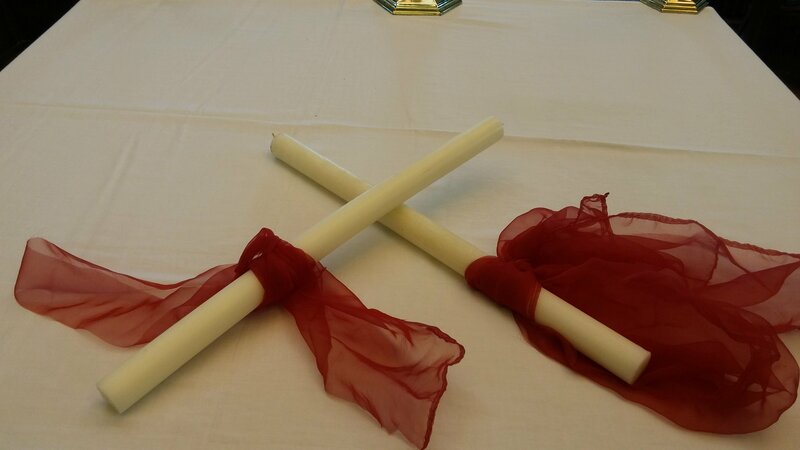 The blessing of Saint Blaise is a sign of our faith in God’s protection and love for us and for the sick. Let us now pray for those who are sick and suffering, for those who care for the sick, and for all who seek the blessings of good health. We pray to the Lord Lord, hear our prayer. For those who suffer from sickness and disease, that they may receive healing, we pray to the Lord. R.
For the mentally ill and for their families, that they may receive comfort, we pray to the Lord. R.
For those with physical disabilities, that the strength of Christ may invigorate them, we pray to the Lord. R.
For doctors and nurses, and for all who care for the sick, we pray to the Lord. R.
For those who seek the prayers of Saint Blase today, that they may be protected from afflictions of the throat and other forms of illness, we pray to the Lord. R.
we desire ever to remain your devout children. of your powerful intercession with Jesus Christ. by your visits, favours and many miracles. Prayers for Fr Stephen, Fr Graham, the Year4God team and work and ministry of the Shrine: a place most special in my heart. The Epistle is written in the N Chapter of N beginning at the N Verse. The holy Gospel is written in the N Chapter of N beginning at the N Verse. *These words [Holy Father must be omitted on Trinity Sunday. Upon Christmas Day, and seven days after. 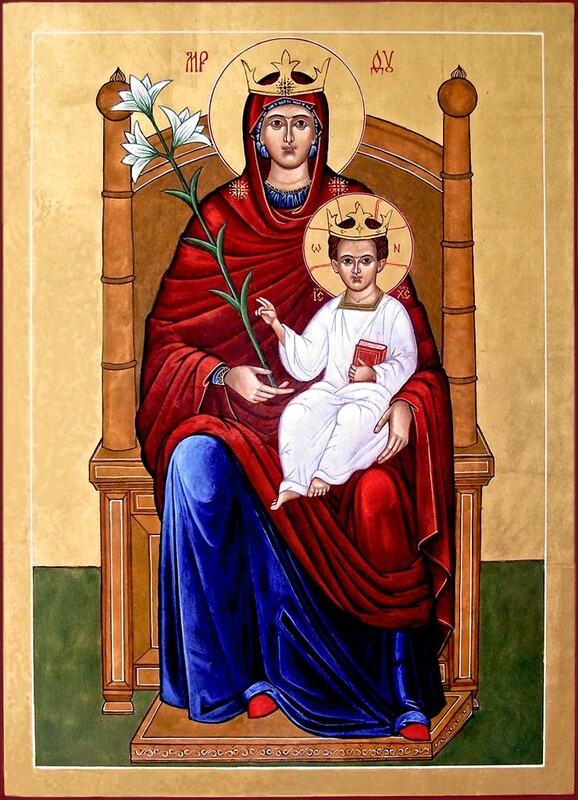 Because thou didst give Jesus Christ thine only Son to be born as at this time for us; who, by the operation of the Holy Ghost, was made very man of the substance of the Virgin Mary his mother; and that without spot of sin, to make us clean from all sin. Therefore with Angels, etc. Upon Easter Day, and seven days after. But chiefly are we bound to praise thee for the glorious Resurrection of thy Son Jesus Christ our Lord: for he is the very Paschal Lamb, which was offered for us, and hath taken away the sin of the world; who by his death hath destroyed death, and by his rising to life again hath restored to us everlasting life. Therefore with Angels, etc. Upon Ascension Day, and seven days after. Through thy most dearly beloved Son Jesus Christ our Lord; who after his most glorious Resurrection manifestly appeared to all his Apostles, and in their sight ascended up into heaven to prepare a place for us; that where he is, thither we might also ascend, and reign with him in glory. Therefore with Angels, etc. Upon Whitsunday, and six days after. Through Jesus Christ our Lord; according to whose most true promise, the Holy Ghost came down as at this time from heaven with a sudden great sound, as it had been a mighty wind, in the likeness of fiery tongues, lighting upon the Apostles, to teach them, and to lead them to all truth; giving them both the gift of divers languages, and also boldness with fervent zeal constantly to preach the Gospel unto all nations; whereby we have been brought out of darkness and error into the clear light and true knowledge of thee, and of thy Son Jesus Christ. Therefore with Angels, etc. Who art one God, one Lord; not one only Person, but three Persons in one Substance. For that which we believe of the glory of the Father, the same we believe of the Son, and of the Holy Ghost, without any difference or inequality. Therefore with Angels, etc.